If You Missed the Trial of the Century, Then Wait. There Will Be Another One Soon. June 17, 1994 – I was at a Bluegrass festival being held at the Ward Ag Center in Lebanon. Porter Wagoner was the emcee, and I have no idea why because he was not a Bluegrass artists. Jim and Jesse performed, but I cannot remember who else was on the docket. Why remember a long ago Bluegrass festival? Because word filtered through the crowd that O.J. Simpson, whose wife had been brutally murdered with her friend a few days earlier, was leading a low-speed chase through the freeways of Los Angeles. 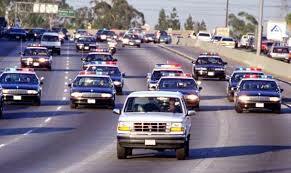 Helicopters were hovering over the white Bronco as O.J. and Al made their way through the city. As millions of people were mesmerized by the chase, I was listening to some of that good old mountain music. Through the years, I have seen the documentaries and the reruns, but the live version went on without me. In those days, you could not even bring it up on your phone. I know that is hard to imagine. Of course, the events of that week led to a nationwide fascination with the case and the trial that found O.J not guilty. It was known as the Trial of the Century because everyone had an opinion. This post could be about a lot of things. It could be about collective memory and the notion that everyone can remember where they were when a high event happened. It could be about the verdict and the opinions that followed. However, it is not about those things. It is about the fact that there was more than one Trial of the Century. Everyone who remembers the O.J. Simpson trial thinks that it is the biggest legal event that ever happened. That know Judge Lance Ito. They know that it was the first time they ever heard the name Kardashian. However, there were earlier trials just as huge and just as fascinating to the general public. Nathan Leopold and Richard Loeb were students at the University of Chicago School of Law who wanted to commit the perfect crime. Together, they spent months planning the crime and murdered Bobby Franks, a 14 year-old boy. Clarence Darrow was hired to defend them, but his real job was to keep them away from the death penalty. Loeb was killed in prison, and Leopold was released after serving 33 years. Tennessee outlawed the teaching of Evolution in public schools, and business leaders in Dayton decided to use that to gain some publicity. They “arrested” John Scopes for teaching the theory and sent word that a trial was to be held. It grew into more than they could have imagined with William Jennings Bryan agreed to serve as prosecution and Darrow agreed to be the defense. The trial was broadcast on radio throughout the nation and became a fight between the forces of religion and the forces of science. Bryan died from the stress of the trial, and Darrow was foiled in his attempt to take the case to the Supreme Court. A technicality overturned the guilty verdict. Charles Lindbergh was the first person to fly a plane non-stop across the Atlantic Ocean. This gained him more fame than he could have ever dreamed of. It also brought tragedy. His child, less than 2 years-old, was abducted, and ransom was demanded. There was an attempt to pay the money, but the child’s body was found a few miles from the Lindbergh home. It seemed that everyone got in on the investigation, and suspicions finally fell on Richard Hauptmann, who was tried, sentenced and executed. There have been numerous theories about this case. Did Hauptmann do it? Did the real killer get away with it? As the trial was going on, millions of people wanted to know. With that curiosity, we can be certain that there will be Trials of This Century just like there were Trials of the Last Century. Actually, we have already had one. I wonder what ever happened to Casey Anthony. Not to mention Lizzie Bordon … but maybe that doesn’t count because it was a different century. It was a biggie, like OJ was. That would have been a Trial of the Century Before Last. True because the trials you wrote about were technically all in the last century. Time. It just keeps slipping by. We have one going on…or is it already over? Different country though but very high profile. The Oscar Pistorius trial. Very high profile. Last night, a show was comparing it to the Simpson case. I wonder how that one will end. He’s managed to turn about everybody against him but then popular sentiment is not necessarily ‘justice’. That was the first time we all heard the name Kardashian. At least Kato Kaelin disappeared. Poor Kato has been trying to make a buck off the trial ever since. In the UK we are currently fascinated by the Oscar Pistorius trial in South Africa. It’s fascinating here, too. How can someone mess up that bad? Another “Trial of the Century” was the Claus von Bulow case. He was convicted of murdering his wife, and sentenced to 30 years in prison. But, the conviction was reversed (with the help of Alan Dershowitz) on a technicality. Then there was a new trial, and Claus von Bulow was found Not Guilty. I am from Rhode Island, so this was a huge deal for us in the ’80s. They even made a movie out of it – Reversal of Fortune starring Jeremy Irons (Claus von Bulow), Ron Silver (Alan Dershowitz) and Glenn Close (Sunny von Bulow). I completely forgot about that one but remember it now. During that time, the von Bulow name was everywhere.